Do we know it GA tix will be credit card entry only again? The end of CC entry would be one great change! Hope that's the case for fan club seats, too! Pretty vague answer as usual. I don't understand why they always keep information so mysterious. Even in the screenshot that @monica martino posted, their answer is somewhat ambiguous as to what the actual method of delivery will be (paper, electronic, credit card entry, will call, mobile entry, etc). Great. It's really annoying to not know what the CCE situation is going to be (although it's good to hear that parents, etc. won't have to physically attend if they buy tix for kids, which was a big problem last time). I say this because it affects plans, etc. If I had to guess, I'd say that both GA and Red Zone (but not seats) will be CCE, as has been the case for the last two tours. There isn't any way to authorize someone else to attend? 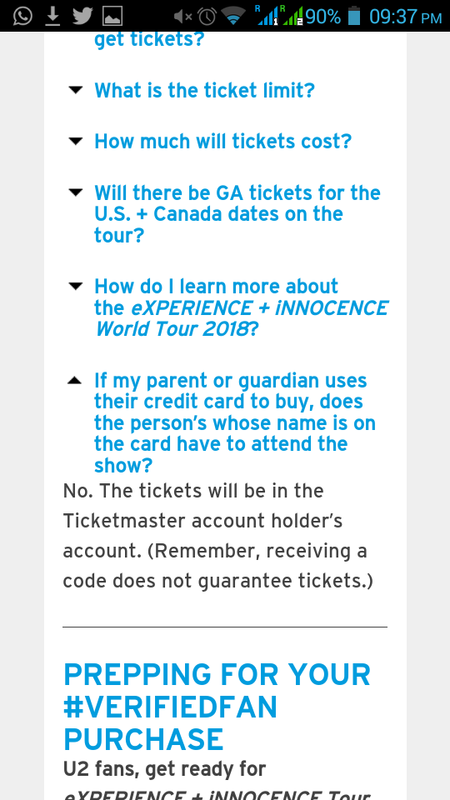 I had Will Call tickets and I believe there was an option to add an authorized person on Ticketmaster so someone else could pick up the tickets. I didn't need to do that because I was there and I picked up my tickets from the U2 VIP people though so I'm not sure if it works the same way. It would definitely help if there was a way to basically transfer the tickets to someone else, and just have that person show ID and not necessarily the CC used for the purchase. Or if it's the case of kids they should accept a family member (i.e., child) and not only the parent who bought the tickets.